Thanks to some heroic efforts, the LaSalle Street Auto Row area in Aurora is undergoing preservation and a revival. Al Capone once owned this car. There are patched bullet holes in the back. During our tour, newpaper reporters were on hand for stories about the LaSalle Street Auto Row. Maria Zanis, dressed in period clothing, stands on the roof during a demonstration of the car’s features. Lunch in a clean garage surrounded by vintage vehicles– another Lincoln Highway Association Conference tradition! The bus stopped at the Seedling Mile historical marker and Lincoln Highway Coalition gazebo on the campus of Kishwaukee College. 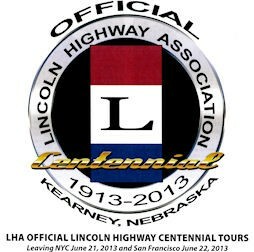 Another Lincoln Highway Association conference tradition–photograph everything! This is an historical marker for the Seedling Mile–honor students at Kishwaukee College took on having the marker placed there as a group project several years ago. This is me, weighted down with cameras and the tour bus script. 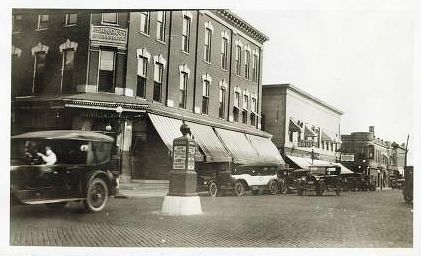 The tour passed the restored Standard Station in Rochelle.